During the month of March 2019, Wesbury residents, staff and volunteers gave 209.5 hours of service through various public engagement-community involvement opportunities. Thank you for your time and service to the community! Residents baked desserts for Cochranton American Legion, clipped coupons for troops and participated in the Mealtime with Mentor program. Wesbury staff participated in Leadership Meadville, Junior Achievement, served on MMC (hospital) Board and committees, CCYSA (Soccer) Board, CATA (transportation) Board, Meadville Public Library board, Meadville Ministerial Association, Meadville Area Recreation Complex (MARC), Crawford County ARC board and Business and Professional Women. Wesbury staff and villa residents sponsor Relay for Life teams, other staff participate in Judith’s Jig which benefits Women’s Services, CASA and the Pancreatic Action Network and help serve community dinners benefiting the Townville Volunteer Fire Department. The French Creek Community Theatre has a Wesbury staff person on their board as well as family members of staff participating in theatre performances. Wesbury staff hosted an Estate Planning event, a Healthy Living Speaker Series and a Crawford County History Lecture series. Our facility is used for several community group meetings including Rotary and Rotary Board, Golden Kiwanis, Lions Club, Roundtable, Barbershoppers, Eastern Star, Relay for Life and Gideons. Body Recall and a Zumba class (fitness groups) also use our facility for their programs. 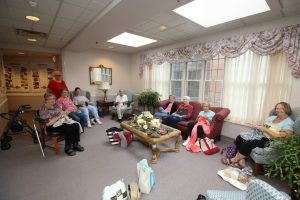 A local knitting group meets once a week at Wesbury and Wesbury residents participate with them in knitting projects for the community. The Keystone Blind Association held a sit and visit session at Wesbury for their members as well as Wesbury residents dealing with vision issues. Wesbury staff are Sunday School teachers, church monitors, worship team members, Cantors, Toastmasters, Scout leaders and borough auditors. They teach first aid classes, visit hospital and hospice patients, conduct funerals, and help with community events.